Catfish is a difficult film to review, as the biggest moment in this documentary is also the one that can’t be revealed without spoiling it for anyone that has yet to see it. It is a documentary from filmmakers Henry Joost and Ariel Schulman that focuses on Schulman’s 24-year old photographer brother, Yaniv “Nev” Schulman, as he experiences a shocking surprise stemming from a romance that began on Facebook. If you have seen the trailers or commercials, then you know that the film is based around this surprise, and the rest of the plot revolves around this major twist like planets orbiting around the sun. But what you won’t gleam from the trailers is that while the surprise might be the driving force of the documentary, the film really shines in the deep and thoughtful examination of why things are the way they are in the first place. In doing so, it elevates Catfish from the internet cautionary tale that it could have been, to something far more. The documentary follows the burgeoning and unexpected relationship between Nev, a photographer in New York City, and the mysterious and beautiful Megan. Megan is the older sister of Abby, an 8-year old prodigy in a rural Michigan town that first contacted Nev to seek permission to create a painting based on a published photograph that he had taken. Once the painting was complete, Abby’s mother Angela then sent it to Nev, who was immediately impressed by the quality of the artwork. The paintings, Angela claimed, would likely have sold for several thousands of dollars, and the family was planning a showing for Abby in a gallery they owned. This began a series of exchanges, first of art, then of information, and Nev soon became friends with Abby, her mother, and several other family members and friends. Soon Nev and the 19-year old sister, Megan, connect through Facebook. The two soon begin a correspondence that begins as just a friendship, but soon blossoms into a long-distance romance. The couple traded emails, IMs (instant messages), texts and speak on the phone for the next several months, all the while discussing how and when they will meet. Nev’s brother, Ariel, and his documentary partner, Henry Joost, decide to film the long-distance relationship, partly for the romance itself, and partly to highlight the technology involved with a relationship of this sort, and how people can connect through various means. As Nev begins to fall deeply for the woman he has never met, certain facts begin to stand out that raise more questions than answers. Nev and his friends decide the only way to know the truth is to head to the family’s home of Ishpeming, Michigan and confront them. This documentary can, and likely will, suffer from two major misconceptions. The first stems from the advertising. This seems to be a growing, and alarming trend- when a studio is unsure how to market a movie, they will make it appear like the film is a genre movie that will attract the fans that are willing to take a chance on the movie without knowing much about it simply because they are devoted to the genre. The American did it when the trailers promised a high octane, Jason Bourne-style adventure, but then delivered an art house flick that fooled audiences by using every single action scene in the movie in the trailer. Unfortunately the marketing for Catfish seems to be following that trend. Judging by the clips and the posters, you could easily be lulled into thinking that this is a horror movie. The trailers all show the guys walking towards a dark barn, with slightly ominous music playing, as one of them says how creepy it is. Another clip shows the shock that the guys have after realizing things are not as they appear. The poster is entirely black with a blood red catfish emblazoned with potentially ominous tagline “Don’t let anyone tell you what it is”. These are all distortions of the actual content. Catfish is not a horror movie in any way. It would be like marketing The Expendables as a love story, or Star Trek as a character study. Many people might leave the theater disappointed, which is a shame, because their justifiably preconceived notions might do more damage to the reputation of this documentary than anything the filmmakers did. Hopefully it won’t hurt the film in the long run, but it is odd. The second misconception that people will have going into this film is the emphasis placed on the secret itself, which is only half of the movie. Catfish is not The Sixth Sense or The Usual Suspects. The movie does not build to a surprise at the end that will leave audiences with their jaws scrapping the floor in total shock and amazement. The surprise actually comes about half way in, then the rest of the movie becomes about the reasoning behind it. At that point, the documentary stops being a mystery and becomes something much deeper and far more profound. Catfish will suffer from the expectations that moviegoers might have been falsely led to believe, but with luck, enough people will go in as a blank slate and enjoy the experience. Catfish is essentially broken up into three main parts. The first is the back story and the blossoming romance between Nev and Maggie, as well as his deepening bond with the Michigan family as a whole. The second is the suspense that culminates with the big reveal, and the third is everyone trying to make sense of the reasoning that led to the surprise. The first section is fairly straightforward, but it is also the part that will set people on edge, wondering if the film is a fake, or at least heavily staged. Perhaps it is simply cynicism, or perhaps it is the unfortunate timing of the revelation that Casey Affleck’s year-long documentary that followed the continuing descent of his brother-in-law Joaquin Phoenix, I’m Still Here, turned out to be a fake that will have people looking for holes in the truthfulness of Catfish. On the other hand, perhaps it is a testament to Nev and his friends, who have no doubt spent so much time in front of cameras that they come off as if playing a part. Maybe there is a deeply profound point buried in there about the nature of our society and how people now react on camera. There is also the possibility that the scenes shot before the group heads to Michigan were actually filmed later to highlight points that they later discovered to be more important than they may originally have thought- but that doesn’t take away from the moments that are to come, which strike a very genuine chord. Of the three sections, the second- the surprise and the intrigue and suspense leading up to it will no doubt receive the most attention for the film. Discussing it would be pointless though, as the movie needs secrecy during this part in order to succeed. But it is really the third part that makes Catfish more than just a typical documentary, and really elevates the entire production. This is what will catch most people off guard- not the big twist, but rather the very thoughtful and deep portrayal of what happened next, and why the twist happened at all. It was a surprisingly effective piece of filmmaking that makes no judgments, but does an admirable job of allowing the viewer to come to certain conclusions that erase any feelings of outrage that you might expect to harbor. One of the best decisions the filmmakers made throughout the movie was to allow the ending to play out without forcing home any points or editorializing. It would have been easy to do, and in keeping with the earlier tone of the film, but it would have hurt the final product. The first two-thirds of the movie are spent with the filmmakers discussing events, and laying them out for the audience. The final part of the movie wisely backs off and allows the story to unfold through interactions between the people involved. Catfish walks the thin line between legitimate documentary film making, and exploitation of people. The final confrontations are handled with delicacy, which also helps legitimize the project as a whole. There is a heavy reliance on technology in this movie that many will pick up on, especially people that do not use the technology in question. While people that are not experienced in using Facebook might focus on how much of a role the website plays in the movie, those of us that have used the social network for a few years will simply see it as the method of delivery, so to speak, for the story. While this particular film might not have been possible without Facebook, the technology is something that we of the “internet generation” take for granted, and there is no heavy emphasis on it from the filmmakers. The heart of this story is about people, and Facebook just happens to be the method these people use to communicate. It becomes an integral part, but it is not emphasized nor should it be. If the people using Facebook had not had the website to use, the story might not have unfolded the way it did, but it would not have changed anything in the long run with the way the people in question lived their lives. But if you are not tech savvy at all, if you don’t use Facebook and don’t understand how it works, this movie will not make a lick of sense to you. That being said, it is interesting to see the heavy use of technology to both cut costs, and to enhance the film. Rather than using expensive tricks to film a location in question, the filmmakers use Google Maps to show the street. With Facebook status updates and wall comments used as part of the narrative, the filmmakers simply show a status change, such as Megan becoming single, and it tells a part of the story in a fresh way. The film also shows the influence that technology is having on the documentary film genre. You no longer need thousands of dollars of specialized equipment- you just need a few HD cameras, a decent computer, and maybe just an iPhone. That is not really a point of the movie, but an interesting aspect, nonetheless. 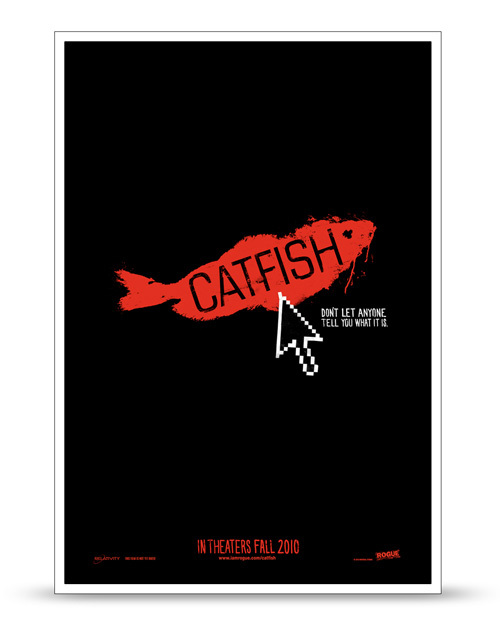 Catfish also highlights the intrinsic trust that many of us put in to our online footprint. That information can be manipulated easily, and lies can quickly be accepted as fact. You will know doubt here the phrase “cautionary tale” often repeated in regards to Catfish and people that have a large internet presence, and this is well deserved, but not a major focus of the film. If you go into Catfish thinking that it is a horror movie, you will leave disappointed, possibly shaking a fist towards the heavens after being once again fooled by machinations of a Hollywood system that isn’t sure what to do with a documentary like Catfish. Go in with an open mind, don’t focus too much on the twist as much as the reasons for the twist, and you might find yourself being slightly moved by the film. If you are not a fan of documentaries, then Catfish probably won’t win you over. I would say it is at least worth a watch as a DVD, but even money says the surprise will be spoiled long before you get a chance. If you are so inclined to check out a documentary in a theater, then Catfish is highly recommended- just leave your expectations at the door. Oh, and as for the term “catfish”, while not entirely a secret, it is revealed at the end, and makes for a nice final thought to the movie. If you can mange to avoid any spoilers at all, the twist is an interesting and shocking one. A surprising story that becomes a deep and somewhat touching one. The heavy use of technology is so taken for granted that most might not see how clever it is. Certain parts with Nev and his friends ring false. Once people know the surprise, they will be far less likely to see this movie, which is a shame.